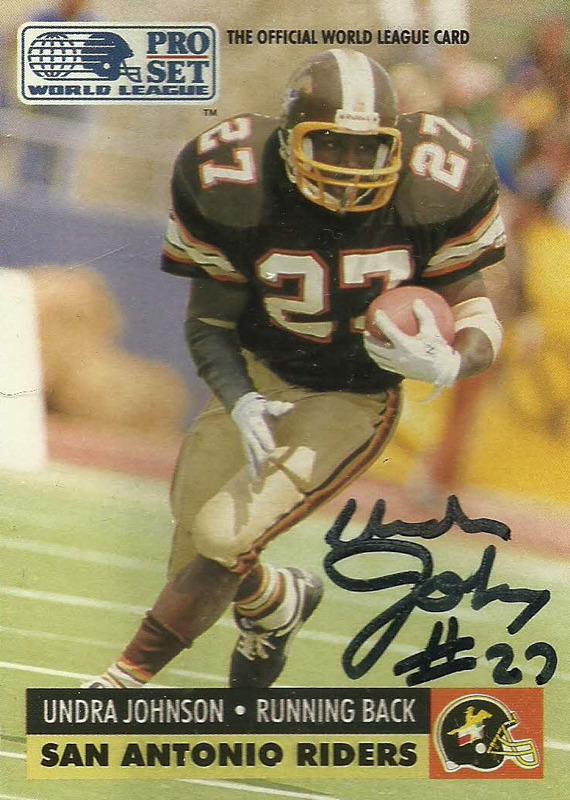 Undra Johnson played college ball for the West Virginia Mountaineers where he led them in rushing as a senior to the Fiesta Bowl in 1989. 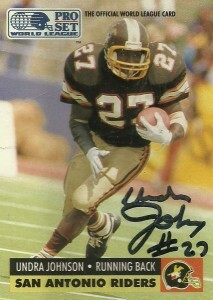 Johnson then earned a 7th round choice out of the strong 1989 draft pool. Selected by the Falcons, he played for the Saints and Cowboys also that season. He’d then be drafted by the Riders with their #1 choice of the WLAF positional draft for runningbacks. Undra was a shifty halfback, and worked well in tandem with the power of Ricky Blake, eventually finishing the season with 258 yards and 2 touchdowns in 1991. He was also the team leader in kickoff returns. Undra had already started selling real estate and dabbling in finance and left the league behind for it full time in 1992. He currently is a securities advisor in Bridgeport, WV. The first season of the WLAF in San Antonio had the Riders playing in dilapidated Alamo Stadium, (home of the Gunslingers of the USFL who even thought it was old,) where they went 4-6. It took them a bit of time to discover their defensive rhythm, and establish consistency under center, but once this had been done, season 2 was a vast improvement as Undra would finish behind teammate Ricky Blake in rushing that season. I sent out for his autograph after discovering his address with the help once again of Wikipedia and a small bit of detective work. He responded quite quickly signing this card that I had enclosed.